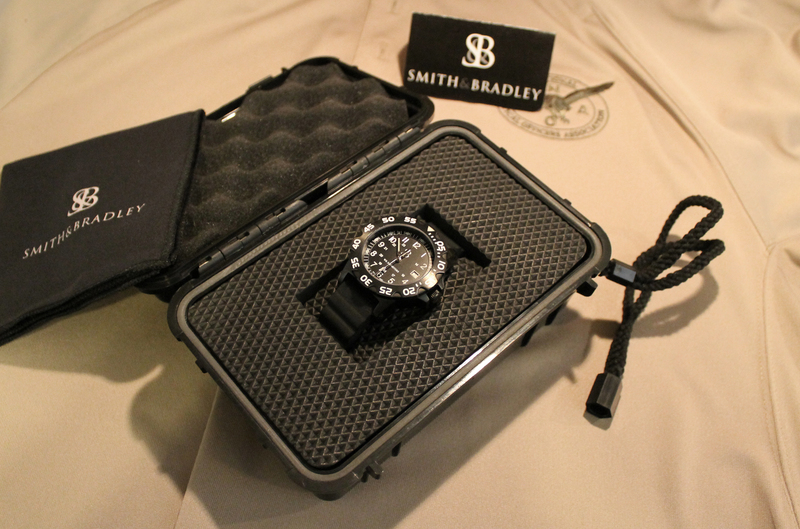 The Sans-13 from Smith & Bradley Watches is intended for law enforcement and tactical military personnel. Jerommie Smith and Ryan Bradley are the Sidney, Illinois founders of the brand. As their first watch, the Sans-13 was designed with input from those who would be the end users–cops and soldiers. Jerommie is a Police K9 Handler and Ryan is an attorney. I met them both earlier this year at SHOT Show and I can vouch for their genuine passion about timepieces. Shortly after SHOT, I bought a Sans-13 from their website. Since then, I have worn this watch from the drudgery of desk work to search warrant services to dicey homicide stakeouts. My Sans-13 was a rugged companion to BDU’s when I instructed active shooter training and a smart timekeeper for my daily business-casual mode of dress. The brain of the Sans-13 is its Ronda Caliber 6003.D three hand day/date Swiss Quartz movement. Protecting the internals is an impressive black PVD-coated stainless steel case, which is 43mm in diameter. The case and stainless steel back are water resistant to 200 meters. A crown guard stands its duty around the screw-in crown. Made for use with or without gloves, the unidirectional ratcheting bezel gives good grip, but does not easily move under normal wear or knocks. As a matter of fact, I don’t think the bezel has turned of its own accord since I began wearing the watch months ago. 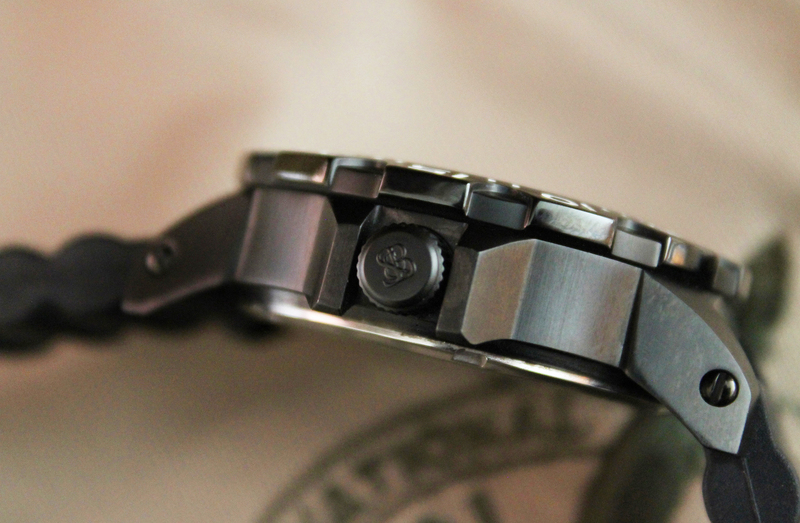 Befitting a hard use watch, the crystal is sapphire and anti-reflective. The black faced dial beneath has large white 12-hour numerals and smaller 24-hour ones. Even to my failing vision, the straight silver hands are well-proportioned and nicely visible against the contrasting black background. A beefy 5mm thick, 20mm wide natural rubber wrist band is secured to the case by slotted screws, not the tricky spring pins found in most watches. 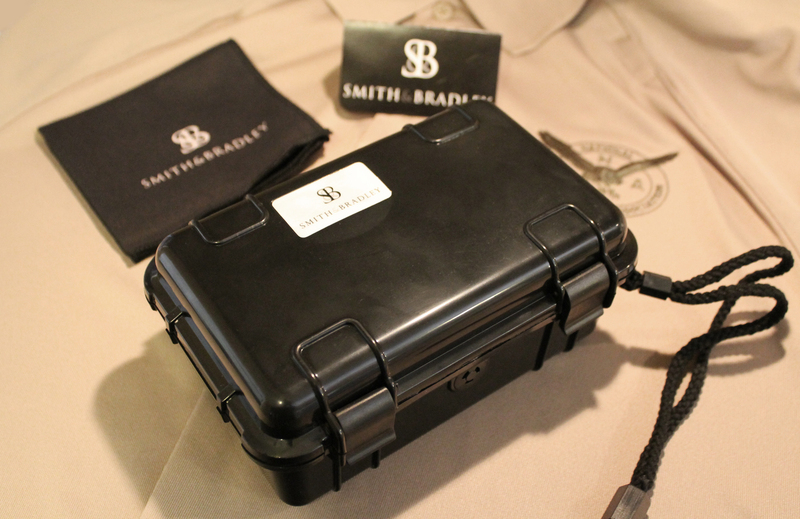 NATO-style nylon bands are also available from Smith & Bradley. 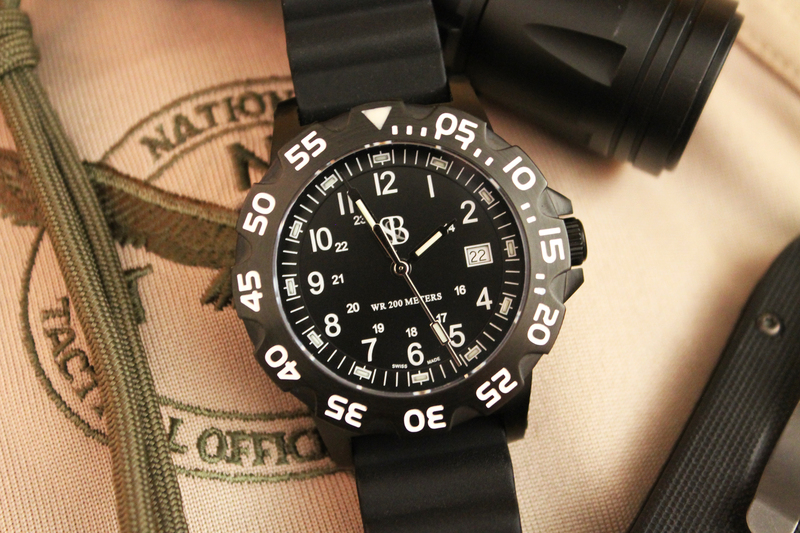 One of the essential design inputs from uniformed customers was a toned-down nighttime luminosity rather than the bright tritium found on many “HSLD” watches. As Smith & Bradley put it, “Only you should see your watch.” With these marching orders in hand, the makers came up with their proprietary Lume Tube technology. 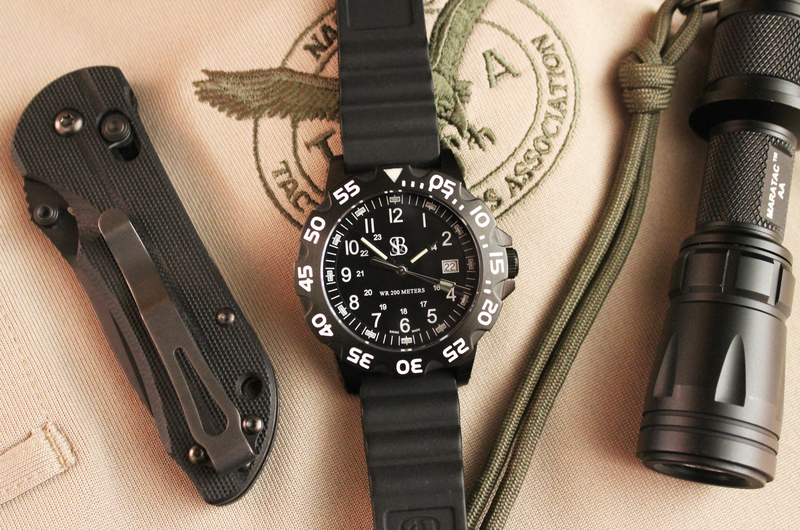 Sans-13’s lume needs a quick charge from a flashlight or torch. 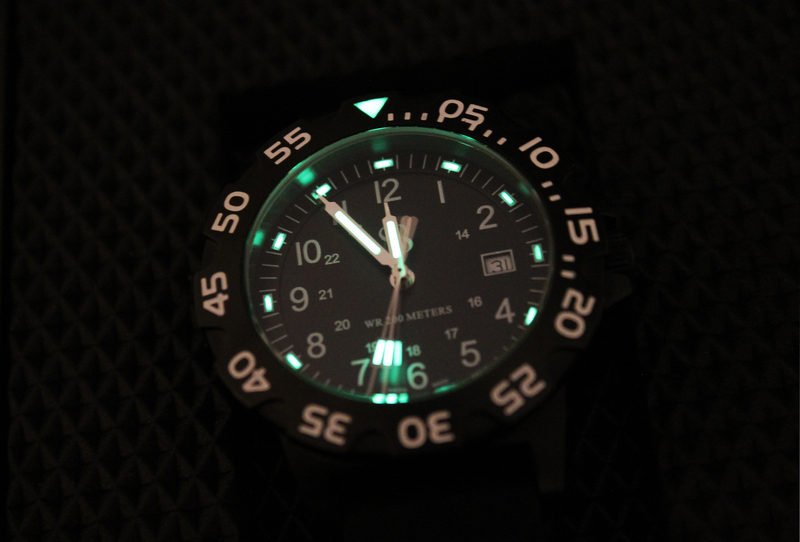 Its restrained green glow is not as glaring as T100 or even T25 tritium vials. As stated, it is just enough for the wearer to see. My photo of the San-13’s illumination is a bit overstated in the long exposure pic. Take my word for it, the watch’s hands, indices, and bezel give just the right amount of light in real life. My Sans-13 arrived in a black waterproof box containing the watch, logo-ed Smith & Bradley microfiber cleaning cloth, inspection check sheet, and a warranty card signed by Jerommie and Ryan. It was certain the watch would arrive intact and ticking in its padded vault. A month or so after receiving my watch, I had a conversation about the company with Ryan Bradley. During our talk, I asked if there was a special meaning to the name Sans-13. He replied that there is no “13” on the dial face. Well, I guess that makes sense. The MSRP for the Sans-13 is $395.00. Ryan reminded me that there is a Military and law enforcement discount if you buy directly from their website. I absolutely love the look and functionality of this watch. 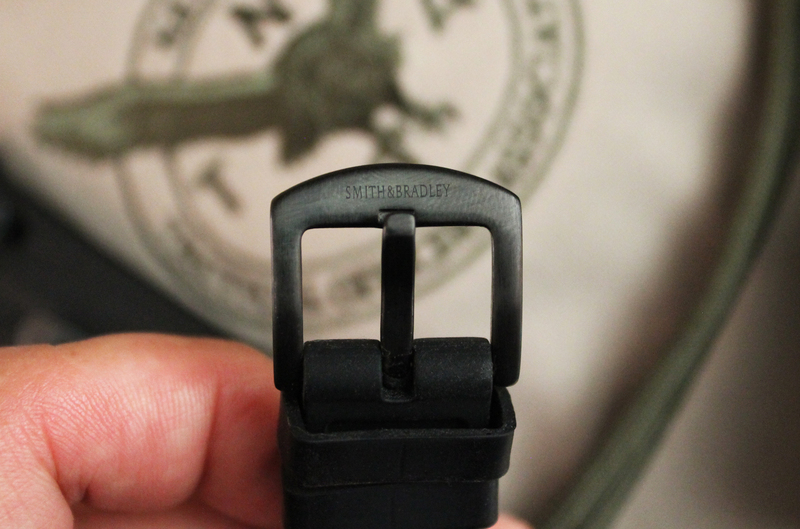 Recently, the Sans-13 was given a National Tactical Officers Association Member Tested and Recommended rating. Since I, too, am an NTOA member, I will second that recommendation. This entry was posted in Misc., Off Duty, SHOT Show, SWAT and tagged SHOT Show. Bookmark the permalink.